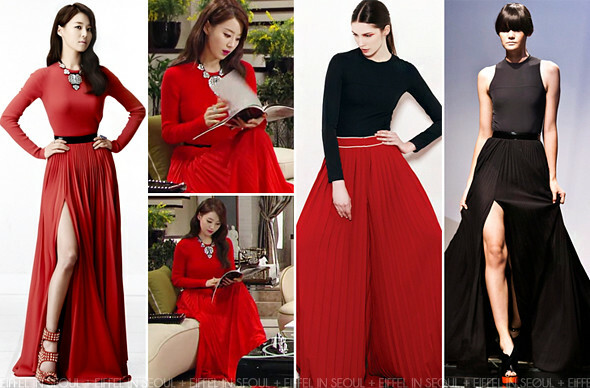 The beautiful Han Ji Hye (한지혜) was dressed in a red Demin dress in the promotional photos for MBC drama, 'I Summon You, Gold! (금 나와라, 뚝딱!)'. She was styled with a silver statement necklace and a pair of studded Giuseppe Zanotti booties. She was seen wearing the same ensemble in episode 2 of the drama. A black Valentino 'Rockstud' clutch to complete her glam look. That material is NOT Denim.